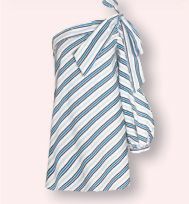 Stand out at your girlfriend’s wedding with this striped cotton mini. A long bow tie hangs from the left shoulder, and the one loose-fitting sleeve is split open along the side. Sundresses don’t need to be bursting with color. This comfy, throwon T-shirt dress falls just above the knee, and a gathered seam running along the right hip creates rolling folds. The buttons, pointed collar, notched lapel, and kimono cap sleeves give this dress the look of an elegant blouse. It’s 100_percent rayon, but the threaded textures in the floral pattern create an embroidered feel. Air your bohemian side with this beautifully embroidered cotton mini. The loose fabric, wide sleeves, and deep-V neckline will keep you cool, while the waist tie creates a flattering silhouette. The denim and off-theshoulder crazes keep going strong, and this breezy number adds a third fun summer trend with its flared peasant sleeves.